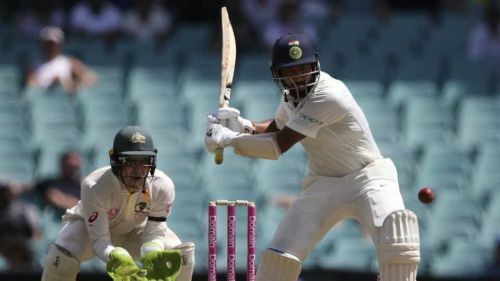 Thanks to Cheteshwar Pujara (130*), Mayank Agarwal (77) and Hanuma Vihari, the Indian team ended the first day of fourth Test match played at the Sydney Cricket Ground in a strong position at 303 for 4 wickets. It was a good decision by the Indian captain to bat first on a good batting pitch as Pujara continued his superb run in this series. The Indian team had two changes in the team with KL Rahul opening the innings while Kuldeep Yadav coming in place of Ishant Sharma. Rahul looked to be struggling right from the start with two streaky boundaries before being dismissed by Josh Hazlewood for just 9 runs. Agarwal was then tested by short balls but he came out with flying colors. Pujara looked at his best again. India went into lunch at 69 for 1. After the lunch break, Agarwal looked positive in his stroke play. The right-handed batsman reached his second half-century off 96 balls and took on Nathan Lyon. He was dismissed by Lyon trying to hit a big stroke at for 77 off 112 balls. Agarwal and Pujara added 116 runs for the second wicket. The Indian captain Virat Kohli came to the crease and played some lovely strokes. Pujara continued his superb form reaching his half-century off 134 balls. At tea, India were 177 for 2. India lost an important wicket straight after the tea break as the Indian captain Virat Kohli was dismissed by Hazlewood for 23. Kohli and Pujara added 54 runs for the third wicket. Pujara continued his merry way with solid defence. Ajinkya Rahane was dismissed with a great ball by Mitchell Starc for just 18 runs. Rahane and Pujara added 48 runs for the 4th wicket. Pujara reached his third century in this series off 199 balls. Vihari played some attacking strokes towards the and has so far added 75 runs for the fifth wicket. India ended the first day on 303 for 4.